A pre-Norman decorated cross, in situ within the lann with which it is contemporary. At Merther-Uny a granite cross, 2.26m high, stands in its original pit within the lann (24541.2) which it is contemporary with, just south of the original western entrance (b3). Shown on the OS map of 1963 (b2). The head, both front and back, has a central boss surrounded by a wide encircling bead, with four deep, offset sinkings, in some places cutting through the bead. The shaft is decorated with dot and panel ornament, with central boss toward the top of the shaft both front and back, although that of the back is more offset to the left (b1). An outstanding example of a pre-Norman cross (h1). The monument measures 1.68m in height, width of head 0.405m, width of shaft 0.355m, thickness 0.23m (b4). <1> Langdon, AG, 1896, Old Cornish Crosses, 346 (Bibliographic reference). SCO3820. <2> Ordnance Survey, 1970s, 1:10,000 OS Map (Cartographic materials). SCO4045. <3> Thomas, AC, 1968, Excavation News 1967-1968: Merther Uny, Wendron (Cornish Archaeology No 7, 1968), VOL 7, 81-82 (Article in serial). SCO4626. 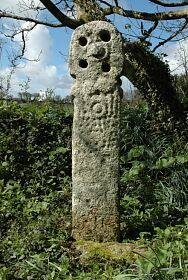 <4> Langdon, A, 1999, Stone Crosses in West Cornwall, 64, NO 101 (Bibliographic reference). SCO3818. SCO3820 - Bibliographic reference: Langdon, AG. 1896. Old Cornish Crosses. 346. SCO4626 - Article in serial: Thomas, AC. 1968. Excavation News 1967-1968: Merther Uny, Wendron (Cornish Archaeology No 7, 1968). CA No 7. VOL 7, 81-82. SCO3818 - Bibliographic reference: Langdon, A. 1999. Stone Crosses in West Cornwall. 64, NO 101.